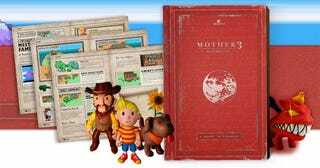 What's the perfect companion to the new Mother 3 English-language translation? Why, this unofficial Mother 3 handbook. It's a guide. Made by fans (Fangamer & Starmen). It's a Mother 3 book. It's a work of art. There's professional printing, there are over 200 pages, and there are even clay model replicas of the game's characters sprinkled throughout for colour. Amazing. The book will be released free online next year, but at $20, the tangible product seems a much better investment.